We are committed to high quality products that are safe, pure and potent. “Throughout my time at ConceiveEasy, I have always been inspired by the way our team always begins with the idea of how to first help empower women and support their reproductive health. Then, through hard work and diligence they make that idea come to fruition as a proven and tested consumer product. 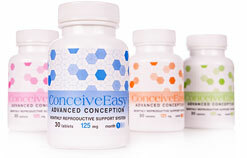 The talent and dedicated team at ConceiveEasy continues to innovate and develop research-based fertility products that make a difference in women’s lives.